Cultivating Intentional Rest through Restorative Yoga. Restorative yoga cultivates the space for deep physical relaxation. It allows for connection to the power of the breath and creates space within the emotional body. Because restorative postures are supported, this practice is truly suitable for everyone. To allow ourselves to fully release in a supported posture facilitates the deep letting go required for self-trust and love. The simplicity of sitting on our mats and doing yoga with blankets, blocks, bolsters and straps writes a warm invitation to the self. For me, this is the part of my practice that has always been sustainable. No matter where I am in my life, I always create a daily 15 minutes for intentional rest. Even with embodied living and conscious decisions for a slower lifestyle, I notice a sense of busyness. By cultivating a conversation with the true self and being mindful of how I walk into my intentional rest time, I set the tone for how I am able to release with the pose. My feelings on a given day govern my awareness of each transition from hand to hand as I rotate over for legs up the wall, followed by the choice of leg orientation and/or weight. If it has been a busy day with my wild little man, lying on a blanket with a strap around the shins and a sandbag or two on the feet is absolutely divine. From the practitioner’s perspective, the mindless chatter stops. My body focuses on the heaviness of the feet in an inverted posture and on feeling the energy run down my legs and ground into the hips. 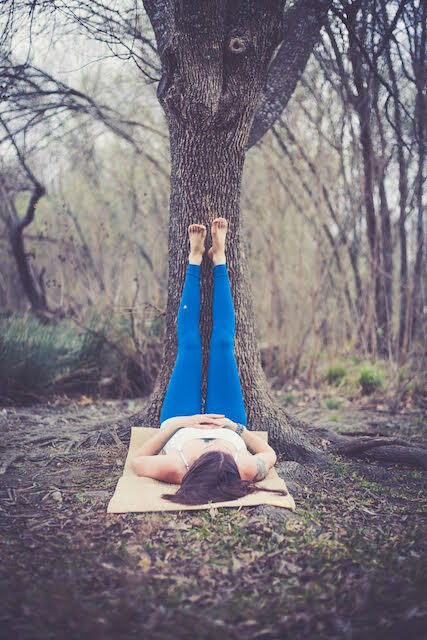 Grounding into the hips cultivates a sense of release and calmness, allowing me to hold a space for openness and forgiveness of any actions I may not have been proud of that day. These moments are vital for balance and self-nourishment. The feeling of the blanket from the hips up the back to the shoulders creates a warm invitation to relinquish more into the earth. To turn over the worries of what I said or did or what I didn’t say or do—to turn over the self-talk to her and know that it is mine no longer. The eye pillow invites in a softness to the skin, heaviness in the jaw and release of the shoulders and neck. From a physical perspective and the seat of the teacher, this is one of my favorite postures to teach. I love to watch how the students transfer within it and hear how they have incorporated this as a tool to be able to release their lower back after a run or refresh their legs after a hike or bike ride, as well as let go of the tensions of the day and give undivided “me time.” It is a posture with so many variations for different bodies and abilities, but serves all. “Legs up the wall” posture can relax and renew at the same time. It provides a restful space within an inversion and always invites the practitioner back—even if just in a meditative thought. Erin Elizabeth Labadie is a certified 700hr and restorative yoga teacher. The intentions of her offerings stem from what her practice continues to teach her, creating the space for connection and healing. She began her yoga practice as so many of us do—with a dvd in college. 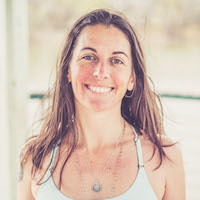 Her practice grew from a space of supporting lower back issues and aspirations of becoming a professional cyclist to realizing that yoga is a truly beautiful and sustainable way to cultivate the connection of body, mind, and spirit.